The story of one small group's participation in this month's historic climate demonstrations is an example of how movements and campaigns can work together to build power for one another. 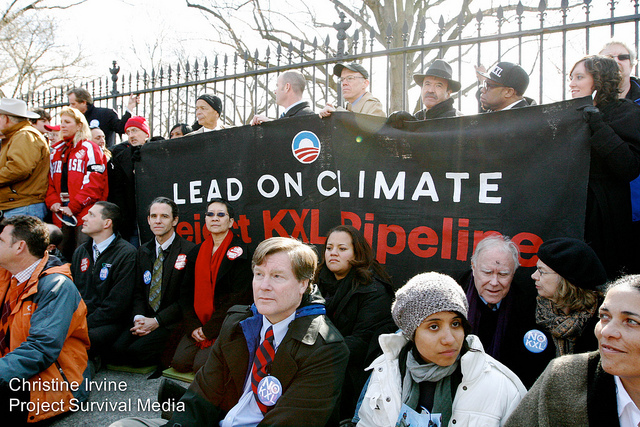 Forty eight environmental, civil rights, community leaders, and celebrities gathered for a civil disobedience action at the White House on Feb. 13, 2013. When I handcuffed my wrist to the White House fence on February 13 along with author Bill McKibben, the Sierra Club’s Michael Brune, civil rights icon Julian Bond and 44 others, it was a big moment for my organization, Earth Quaker Action Team. Here we were, only 3 years old, suddenly part of a high-profile act of civil disobedience in front of a throng of reporters. Strangely enough, it wasn’t even for the issue our group has been organizing against. The story of our participation in the White House arrests, as well as the massive Forward on Climate rally four days later, is an example of how movements not only empower campaigns, but also how campaigns, in turn, empower movements. Earth Quaker Action Team (or EQAT, pronounced “equate”) was founded by a small band of Philadelphia Quakers who wanted to use nonviolent direct action to work for a just and sustainable economy. Realizing the importance of having a campaign with a specific target, we chose to focus on PNC Bank’s financing of mountaintop removal coal mining. The Pennsylvania-based bank with Quaker roots was one of the top financiers of a practice that was causing increased rates of cancer and birth defects in Appalachia. Targeting PNC, which calls itself a “green bank,” was a strategic way to support embattled activists in Appalachia, who often feel forgotten by the wider environmental justice movement. Although both the civil disobedience at the White House and the largest climate rally in U.S. history focused on the Keystone XL pipeline, we felt that participating in these events gave EQAT an opportunity to reframe our campaign after years of being asked why we weren’t working on fracking — the environmental justice issue that makes the most news in Pennsylvania. We explained to both the press and our supporters that as the easy-to-get to coal, oil and gas is used up, fossil fuel companies engage in increasingly destructive methods of getting more. Mountaintop removal, fracking and the tar sands oil that the pipeline is intended to transport are all part of the same big problem: poisoning the water of people who live near them, while prolonging our addiction to climate-change-causing fossil fuels. The fact that I was arrested with nationally known figures like Robert F. Kennedy, Jr. and Darryl Hannah got us interviewed by the Philadelphia Inquirer and the local NPR affiliate, giving us the chance to explain both our campaign and this wider context. Despite some subsequent activist criticism that neither the White House action nor the rally was radical enough, participating in them also gave us unique opportunities to build both our organization and the wider movement. In the past three years, our tactics have included civil disobedience, public account closings and a 200-mile walk across Pennsylvania to PNC’s national headquarters in Pittsburgh. Our last day of action on December 1 hit 15 PNC branches in five states and the District of Columbia, but we know that is not enough to change the fifth largest bank in the United States. We want our footprint to be as wide as PNC’s. In the past three years, we have made many people curious about our edgy style, but we wanted to move those folks from curiosity to involvement. Organizing six buses for the national rally gave us the chance to identify people who were longing to do more than press “like” on Facebook and offered them a first step that was fun and safe. Tapping the enthusiasm the rally was generating, we mobilized other people of faith, environmentalists, college students and Quakers who hadn’t joined us before. We got their email addresses and showed a video on each bus that explained EQAT’s campaign. By the end of the day, we had interested a whole new group of people in getting involved with us — some of whom don’t identify as activists. I gave a ride home to one such woman from my husband’s church who had never been to a national rally before and, despite sore hips and cold fingers, seemed energized by the experience. For EQAT, one test is that the groups we affiliate with are trying to use nonviolent direct action techniques strategically to escalate pressure on powerful institutions. If Sunday’s march had just been a bunch of people walking around the White House and then going home, we wouldn’t have gone to the trouble of turning out six buses. What made it more than that in our eyes was the fact that 350.org had already used civil disobedience successfully — helping to delay the pipeline in 2011 — which means that when they bring over 40,000 people to the White House there is an implied threat, even if the rhetoric of the day was tame. We were also excited by the early rumors we’d heard that there would be civil disobedience and that it would include the Sierra Club. Although the arrests ended up happening four days before the rally — partly to ensure that there would be arrests since the police don’t like to cuff more than 50 protesters at a time — EQAT was encouraged to see the Sierra Club take this step for the first time. In terms of risk, it was hardly like the lunch counter sit-ins during the civil rights movement, but it was an escalation from the group’s previous policy. The challenge for these national groups, and for us, is to keep the movement growing and the tactics escalating, until we become a force that President Obama sees as more important than a golf outing with oil executives, which is where he was during the rally. Finding the right degree of edginess to both grow and escalate simultaneously is a bit of a dance. As I waited for Park Police to cut off my plastic handcuffs, I talked to fellow arrestee Maria Gunnoe, from the Ohio Valley Environmental Coalition, about the brutality of police in Appalachia, where Big Coal controls the political establishment. Gunnoe has the guts to challenge the coal companies in her home state of West Virginia, which is braver than anything I’ve ever done. Yet many of my non-activist friends called me “brave” for getting arrested in front of jostling photographers. One said she was worried sick about me, even though I knew there was no real risk. This gap in perception is a reminder of how much work we have to do to mobilize ordinary people to show the kind of courage and commitment necessary to win against the fossil fuel companies. That is a good example of why EQAT chose to take part in these national events. “We want to reassure average citizens that it’s okay to step out of their comfort zones and empower them to find the satisfaction that comes with taking meaningful action,” said Amy Ward Brimmer, EQAT’s executive director, who was waiting for me when I was released from the Anacostia Park Police station a few hours after my arrest. It is EQAT’s hope that we will model the passion and possibility that enable people to act boldly and locally, while giving them the reassuring feeling of being one of the many. One of the strengths of EQAT is that we are working hard to use strategic campaign logic. That means we are going for long-term wins over short-term gains. A key part of that strategy is building our numbers and then expanding their experience of nonviolent action. The Forward on Climate rally was a great opportunity for a huge array of disparate folks from Quakers, Presbyterians, Jews, students, retirees, educationalists, business people, activists, parents, hippies, anarchists, working-class, middle-class, white, black, brown, US citizens and non-citizen immigrants. For a small group like EQAT, we added over 200 names to our small-but-growing email list. That translates to more than a 20-percent increase to our list. Our job is to mobilise that growing list into ever-escalating actions that put people’s bodies in the way of business-as-usual of fossil-fuel companies and the institutions that fund them, like PNC Bank. I agree with George Lakey in reaching those not considered activists, because I’m one who hasn’t been thinking in those terms until about a year ago. And, those terms are those generally associated with activists. Meaning, as described by the general population as left-wing fanatics, or so. While I was born to confront, and have held such abhorrence to “authority figures,” whatever that means since the People have the authority to dismiss our governments at will, I held to a more conservative position since I was brought up to despise Democrats. Well that hasn’t changed, but today I despise Republicans too. Reject is more accurate than despise. There are a good many traits which have been held by Republicans, and it seems the left-wing despises those traits and more. While I’m using some terms loosely, my point is these camps people put themselves into by choice is a great factor in staying apart or dividing the People. While belonging to a group makes one warm and fuzzy, they seem to always lead to friction and then violence. This is what anyone can reason on their own if so inclined. And, it’s brought me to Independence by rejecting this “wing” stereotype. I feel strongly that taking certain positions will doom a cause or fulfill a dream. Earlier today I stated a strong position and I’ll see if it was the right choice. In any case accepting responsibility is a cornerstone to any group effort. Yes, Eric, we absolutely have to reach people who don’t think of themselves as activists. I know for a fact that the Forward on Climate rally included many such people. For groups doing this work, I think we need to be both welcoming and inclusive of people who have a wide range of political assumptions while at the same time articulating a clear set of values and goals. It’s tricky. I know that my own political evolution has been helped most by people willing to converse openly with me about their views, not those who seemed to preachy and condescending when I didn’t seem to fit their camp.